Lounging in a cafeteria, sipping coffee and gobbling greasy donuts is a different type of summit experience. Surreal and disappointing in many ways. Luxurious and pleasurable in others. 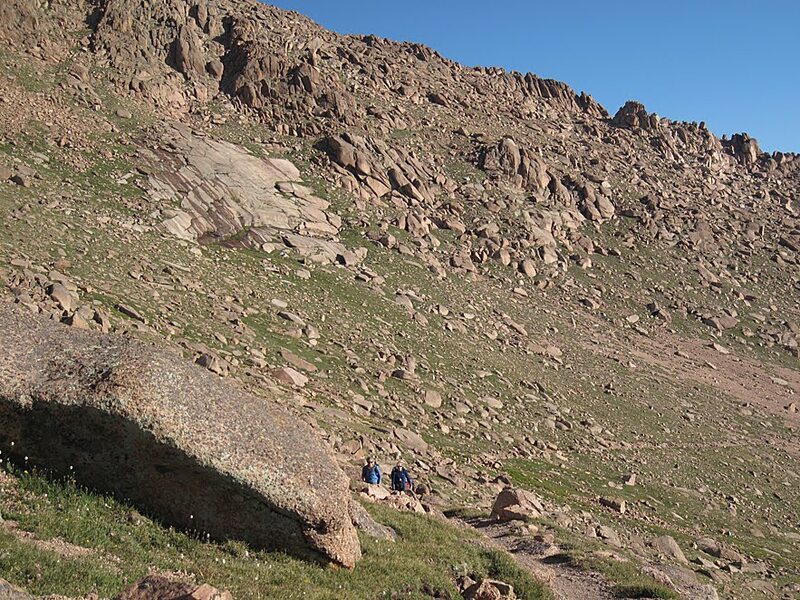 Nothing in our previous twenty-one fourteeners had prepared us for it, not even the paved road and biker-swarmed bathrooms atop Mt. Evans. 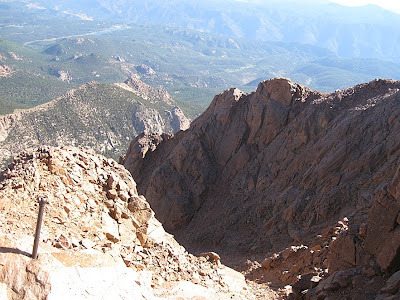 The Pikes Peak experience was strange enough that we all felt somehow as if we hadn't reached a summit at all, as if we'd climbed and climbed never to find the top. 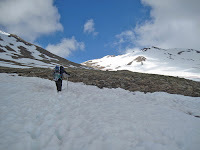 But we had worked hard enough, it seemed, to have earned two mountains, for we ascended over eight thousand feet and hiked twenty-four miles in two days. But something about being joined by cars, motorcycles, and a train destroyed the serene sense of accomplishment that usually accompanies a high-mountain summit. 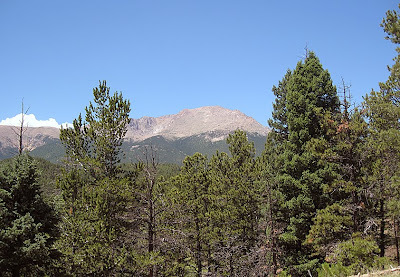 Our long peregrination up Pikes Peak began the day before at a lowly 6,500' in the crowded streets of Manitou Springs. 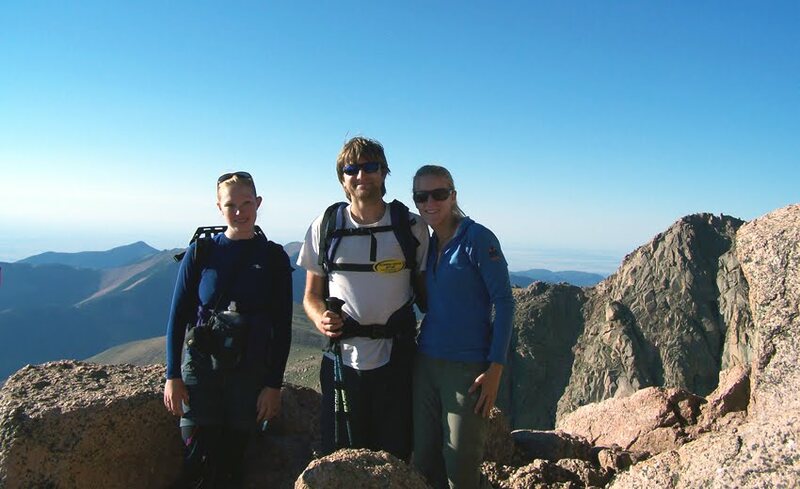 We trudged with fifty pound packs along the first three busy miles of the famous Barr Trail, dodging casual day hikers, runners training for the Pikes Peak marathon, and the tired ghosts (for that's all they seemed) of climbers returning from the distant summit. I admit some alarm at the sheer volume of two-legged humanoids on this part of the trail, especially for a Monday morning. But once we passed the top of the Incline Loop (an off-shoot of the Barr Trail) the crowds ceased and the slow, steady climb towards "world-famous" Pikes Peak was mercifully quiet. After about six miles and almost 4,000 feet of climbing (including some up and down), we arrived at the amicable property of Barr Camp. Contrary to my prior image of Barr Camp as a mountainous tourist trap and a jarring intrusion of society on the wild, it instead presented a wonderful example of natural/human harmony in an ambrosial setting. 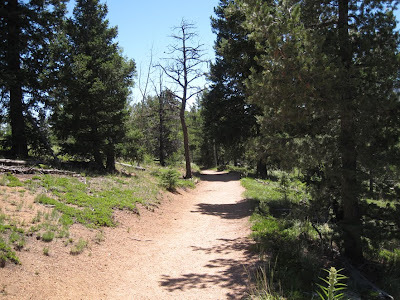 It was a welcome scene and a place of regenerative respite, especially on a route as long and tedious as the Barr Trail. The nature-conscious owners offered open doors even to non-guests and promoted without proselytizing No Trace ethics to the many Pikes Peak visitors. They were always willing to share good conversation and entertaining mountain wisdom with any who bothered listen. We reposed for the afternoon, observing the complex social interactions of ground squirrels quarreling over ears of corn discarded by previous, careless campers. 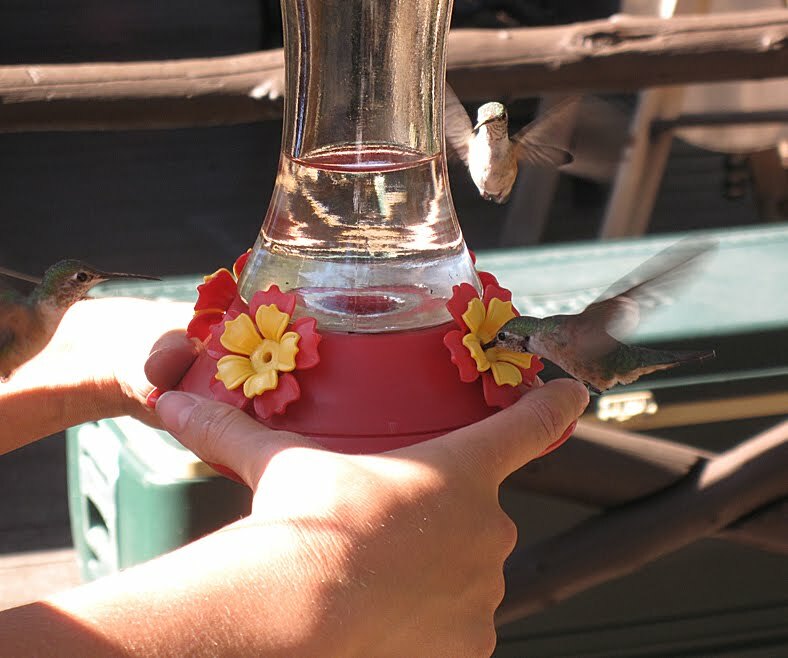 Theresa, one of Barr Camp's benevolent owners, showed us a trick of cupping our hands around the base of her bird feeder to feel the gentle feet of hummingbirds and the subtle wind from their wings as they swooped in to feed. The next morning we arose at the incommodious hour of 4:00 am and engaged in a somnambulistic trek through the last hours of darkness. The silver moon was falling in front of us and the first rays of morning rose behind, giving us the sense that, depending on which way we faced, we could experience both day and night. Far below us the lights of Colorado Springs twinkled like a reflection of the nighttime sky. The pollution (usually a choking distraction to all things beautiful) exacerbated the colors of the morning, setting the sky alight with blood-orange and pink hues. Soon after the moon vanished and morning had risen, we passed the ghosts of trees burned from a hundred-year old fire. Though Gerry Roach referred to this section as "grotesque" in his guidebook, I found it instead to be a beautiful example of the cyclical nature of death and re-birth in the wild. 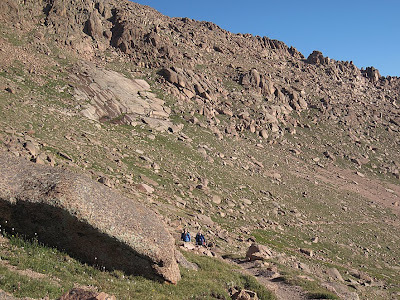 The area above treeline on Barr Trail was a wonderful playground of rotund granite boulders and scraggy alpine shrubs. The trail was as quiet and peaceful as any we'd climbed on a fourteener. Still high above us we could see the summit house emerge and draw steadily nearer. Finally, we reached the so-called "Golden Stairs", a 32-switchback finale to our twelve-mile climb. 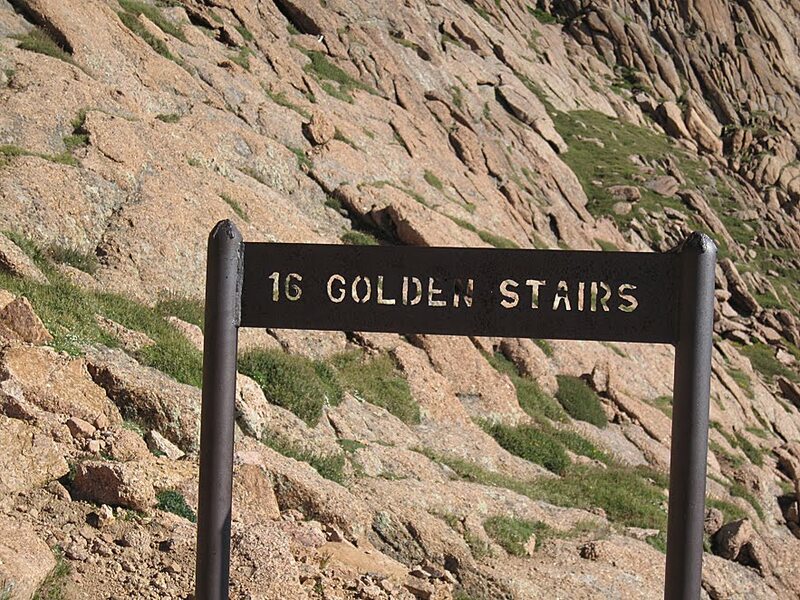 We used the last of our muscles to persevere through the "Golden Stairs" to reach Pikes peculiar summit. 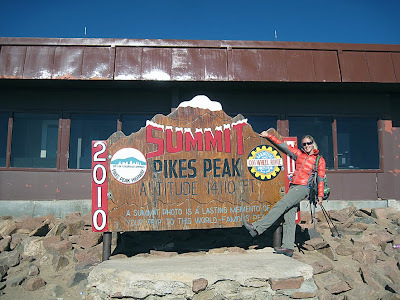 The summit house of Pikes was a surreal place and an idea that I hope is never duplicated on any mountain. The true summit was a forgotten piles of boulders a hundred yards past the train station in the center of the parking lot, so, with true mountaineer spirit, we climbed a few more feet to imagine a Pikes Peak before commercialization. The detritus of numerous construction jobs dotted the landscape and the pollution that had illuminated our sunrise so vigorously now rendered any distant vista nigh impossible. It was hard not to view Pikes' summit as an extinguished, castrated place. There can be no doubt that before the chimneys of industry, and before its exploitation and commercialization, Pikes' summit was one of the most powerful and majestic mountaintops in all the American West. Much of that majesty has now been lost. The hike down Pikes was a long and grueling ordeal. After six miles we returned to camp, broke down our tents and grudgingly re-packed our accoutrements. 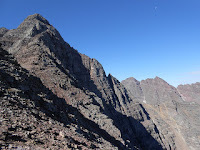 For the second six miles of the descent we carried the burden of fifty pounds on our backs, the price of splitting Pikes into a two-day trip. By the end we had hiked a brutal 18 miles, ascended over 4,000 feet, and descended almost eight-thousand feet (more counting the ups and downs). 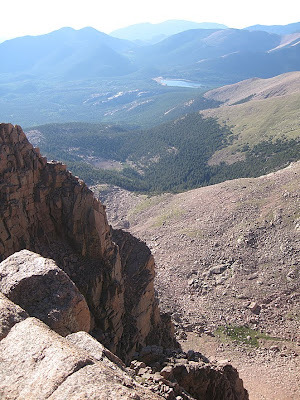 It was without question the most difficult single day of hiking for the summer. 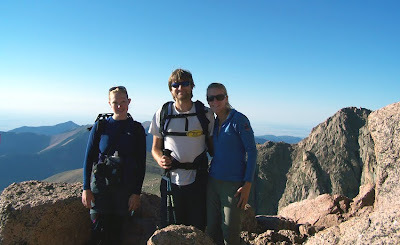 So Pikes Peak is behind us, and in some ways I am split on the idea of ever returning to Barr Trail. It was a beautiful hike and a special place. But the disappointing summit is anti-climatic after so vigorous an effort. I had a wonderful experience on Pikes and wouldn't have changed anything about it. But I think should I ever feel the need to return I might just seek another, shorter route.